This Saturday, 6 October, at 10 am GOB is organizing a working day eliminating invasive plants in the Fornells area. For some time now gardening with exotic plants has given rise to some of the species colonising coastal places so becoming invasive. It is precisely here, along the coast, that they have threatened the endemic vegetation (species whose distribution becomes so reduced that they are sometimes the only ones left in the world) that grows on our island. These areas were little frequented before the tourist boom so that the coast acted as a refuge for some determined species that became highly adapted to the conditions of wind, salt and the scarcity of fresh water. These days the areas are much appreciated both on a tourist level as much as on a conservation level. Communities such as the socarrell or the limonium, which are established a few metres from the coast line, are some examples. 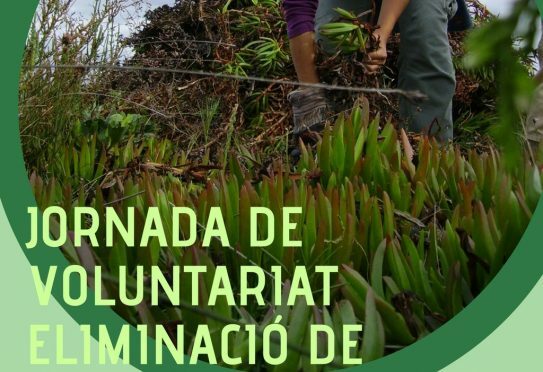 So, this Saturday, GOB has organized a working day to get rid of invasive plants such as the Carpobrotus (also known as patata frita). This is colonising the coastal area and threatening the communities of autochthonous plants. To participate, send an email to administracio@gobmenorca.com or telephone GOB (971 35 07 62) and specify the number of people that will be with you. This is necessary to organise the materials and snacks of products from the network of farms participating in the Land Stewardship scheme. If you have them, bring your own gardening gloves. It is expected that the day will finish at 13.00 hours. As an alternative to growing invasive plants GOB promotes the use of autochthonous plants for the gardens of Menorca. This not only avoids the problems of the aggressive colonisation of invasive plants in natural places but they are also low cost maintenance, often associated with reduced watering, so important as water is a scarce commodity on our island.